* Barbie Avenue Twist N' Turn Barbie Musical Animated Phone is a TeleMania Segan Products/Dominion Entertainment, under license from Mattel production. 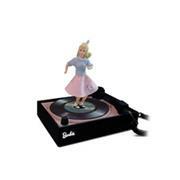 * Authentic 7-1/2" sculpture of Barbie wearing Poodle Skirt dances to original Chubby Checker music while the record turns. * Features: Demonstration Button, Last Number Redial, Switchable Ringer, Tone/Pulse Switchable, & Volume Control. * ETL Listed & FCC Approved. Hearing Aid Compatable. Requires 4 "C" Batteries NOT included.